As you are often doing research in places you have never been to, it's quite important to have good maps to search for the proper towns, villages and other locations. There are many maps and other websites which can help you in your research and which can provide you better idea where your ancestors lived. The best source for maps all over the globe are definitely Google Maps. They provide you satellite, terrain and "normal" map and are quite good in searching for unknown places. Their great advantage is the fact that these maps are available in English. The satellite maps are really detailed which is great to see the buildings' layout in the village and so on. 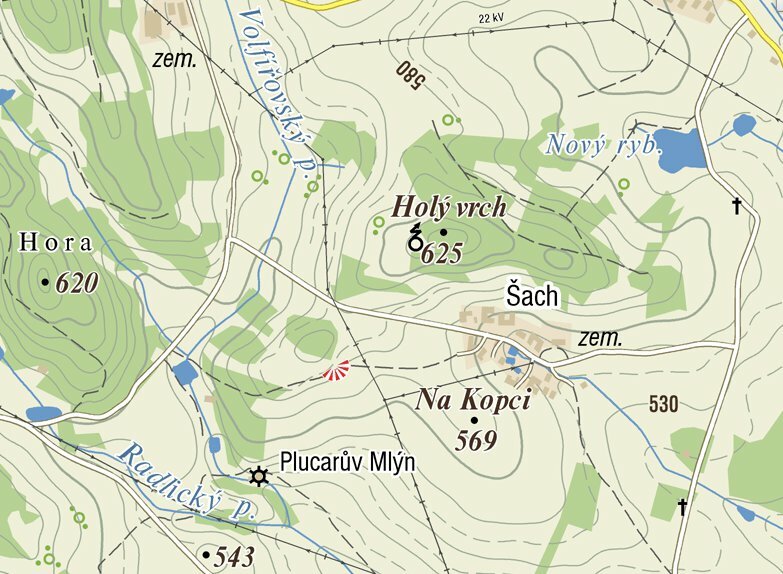 The best Czech map source is website Mapy.cz. It's not available in English, but there are several features which can't be found anywhere else. There are 6 layouts available - usual map, tourist map, three different satellite maps and the most important layout, historical map from the 1st half of 19th century. Tourist map helps us to see most details in the country. Map below shows village Šach (see How I found my great-great grandfather for more information about this village) and its surroundings and I want to show the information which is included in this layout. So, there is village Šach more or less in the middle of the map. What can you see around? Na Kopci (means on a hill) is a hill which is 569 meters high, Holý vrch (bald hill) is 625 meters high. There are some more hills without names marked on a map. There are two creeks with names - Radlický p. and Volfířovský p. These names are based on the names of surrounding villages, Radlice and Volfířov, p. stands for potok, which means creek. There is also Nový ryb. - Nový (means new) pond to the north-east from the village. Green color are forests, white color are field, pastures and meadows. You can see two crosses by the road in the right part of the map. Those are real wayside crosses. Plucarův mlýn was a real mill in the past, there is probably some family resort today. Abbreviation zem. stands for the agricultural cooperation company. There are many other signs on the tourist maps like castles, churches, chapels and many more. Historical map helps us to locate villages by their old (German) names. 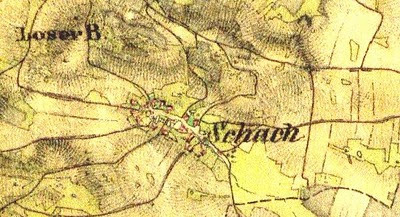 As you can see on old map of Šach village, the name was written as Schach. 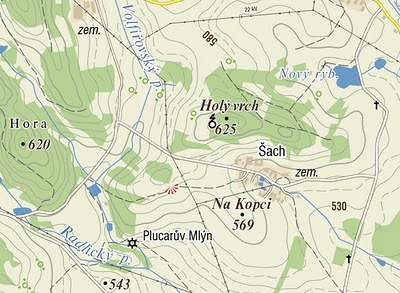 There is also Holý vrch (Loser B. where B. stands for Berg, hill) mentioned on the map. Mapy.cz share old historical maps with website OldMaps.GeoLab.cz - these maps were created during the 2nd military mapping between 1836 and 1852. OldMaps website is available in English which is great for foreign researchers. There are three millitary mappings available (1780-1784, 1836-1852 and 1876-1880) and also some other old maps of Czech lands. Another web application available in English are Archival Maps. The most valuable part are the Imperial Imprints of the Stable Cadastre which were created between 1824 and 1843 both in Bohemia and Moravia. These maps show us cadastres of each village with the detailed view of each house layout. But be careful - the numbers there by the houses are not house numbers but plot numbers. First you have to find out on the plot number in the cadastral register. I have written a guide to the cadastral register so it's easier for you to get the plot number. The Stable Cadastre also contained working version of the maps. These working maps were called designated drafts and contained both plot numbers and house numbers. Unfortunately these drafts are available only for Moravia and you can access them on Moravian Land Archives website. Again the website is only in Czech but you can search for your village by alphabetical search or by putting the village name into the Název (name) column and pressing enter. It will give you the list of available villages and you can choose from them the one you are searching for. But remember - only Moravia (and small part of Silesia) is included! I looked at the maps and was able to find Rosshaupt and St. Catharina on one of the maps. I can see how close they were. Excellent post. I love your blog. So many great resources available to push my research backwards and fill in many gaps in those early generations!